GNARBOX ($149) lets you take up to 4K footage from any camera, view it, back it up, organize it, edit it, and share it in full resolution to the world with just your smartphone. Enabling you to leave your bulky laptop at home. GNARBOX isn’t just a pretty face. The internals have everything your need to take you to the next level. 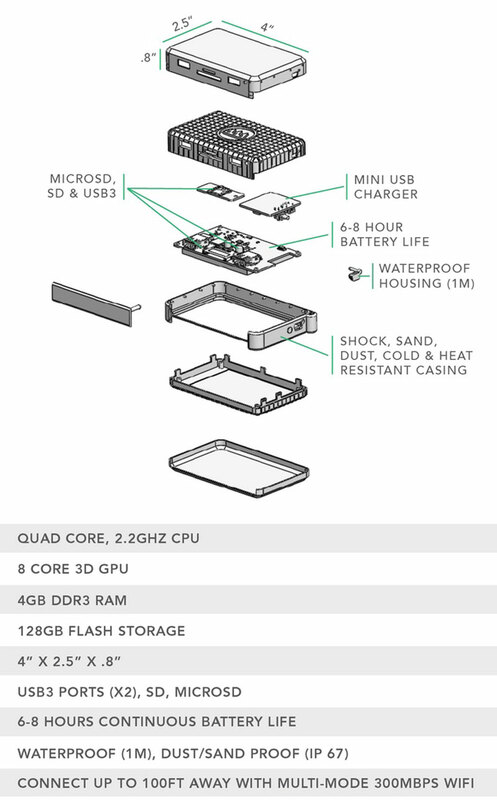 These include a small 4″x2.x”x.8″ box, perfect for travel, a fast 8 core 3D GPU, 4GB Ram, 128GB of flash storage, 2-USB3 ports, SD, MICROSD, 6-8 hours of battery life, and WIFI. What you do with all that is just shoot some awesome video or images, connect your phone by using either the USB3 or memory card ports, and connect up to 4 devices using the builtin GNARBOX Hotspot & GNARBOX App. From there you can do pretty much anything you like. If you want one for yourself get moving because their Kickstarter campaign is ending soon.